Senior officials say coalition agreement could come as early as Thursday. Former Foreign Minister Avigdor Liberman has accepted Prime Minister Binyamin Netanyahu’s offer to join the coalition in return for the Defense and Immigration ministries, senior Yisrael Beytenu officials said on Wendesday. According to senior officials, the Prime Minister’s meeting Wednesday afternoon with Liberman has already laid the groundwork for Yisrael Beytenu’s entry into the government. Shortly after the meeting, Netanyahu reportedly called Defense Minister Moshe Yaalon, informing him that Liberman had requested the Defense Ministry in exchange for his support of the Likud government. 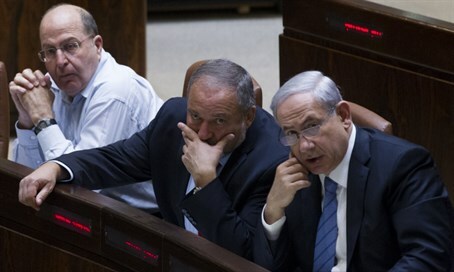 Senior officials have leaked details of the meeting, including Netanyahu’s offer to Liberman, which includes two ministries – Defense and Immigration, both of which are important to winning the support of the Yisrael Beytenu party, which relies heavily on support from the Russian immigrant community. While no formal agreements have been reached, Yisrael Beytenu insiders said that Liberman accepted Netanyahu’s offer. The timing of today’s sudden breakthrough between Liberman and Netanyahu lends credence to claims by Jewish Home officials that talks with Zionist Union officials were in fact a ruse, part of a larger plan to bring Yisrael Beytenu into the coalition. Advisors to Liberman have also suggested that barring any last minute surprises, a coalition agreement could be signed as soon as Thursday. Aides to the Prime Minister also confirmed that the two sides were very close to sealing a deal.